Centrally located in Hazlemere, we are an independent family-owned showroom, run personally by Julian Graham, selling and fitting Kitchens and Bathrooms all around the Home Counties. With stunning bathroom designs from Italy, from freestanding baths to smooth sleek modular washbasin units and distinctive new showering options with beautiful coloured trays from Spain with matching radiators and wall panels, to soft cushioned flooring to give you that extra bit of luxury to showering. We constantly look for new ideas in design and style. Adding that extra special magic to your new kitchen, like 'Slide&Hide' oven, could make such a difference. 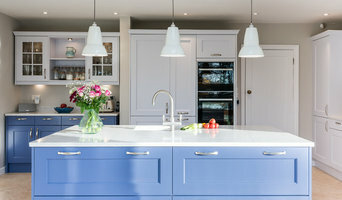 With access to great designs of high quality British and European products you can be confident that you will find the look, style and quality to turn your dreams into a reality and achieve that perfect Kitchen or Bathroom. Customer service is our priority. We understand a new Kitchen or Bathroom is a large financial commitment, therefore we work closely with you to produce designs that you are completely happy with. We know we can find the right look, style and quality you require, so browse our website, contact us and let us turn your dreams into reality. At Haudilar Interiors Ltd, we are focused on providing renovations services with the highest levels of customer satisfaction & we will do everything we can to meet your expectations. With a variety of offerings to choose from, we're sure you'll be happy working with us. Look around our website and if you have any comments or questions, please feel free to contact us. We hope to see you again! Check back later for new updates to our website. There's much more to come! Solus is one of London's most well known and highly-reputable tile supply companies, with over 20 years of experience under our belts. Established in 1995, our team amassed a wealth of experience in bathroom and kitchen design for luxury homes and residential properties. We are also the UK’s leading suppliers of commercial wall and floor tiles for major commercial companies within the retail, office, hotel, automotive, restaurant and bar industries. Our brand new showroom in Clerkenwell carries a selection of over 60,000 porcelain, ceramic, glass, metal and natural stone tiles. We’re equipped with some of the best designers in the city and provide an airy & contemporary space to sit down and discuss your project plans. We thrive on forming strong working relationships with industry leading manufacturers and all our architectural, specification, designer and residential customers. Visit us today! Design, supply and installation of beautiful bathrooms & home refurbishments. Providing high standards of professionalism and delivering high quality, real value work on time. Slav Tiling & Flooring is a family run business. 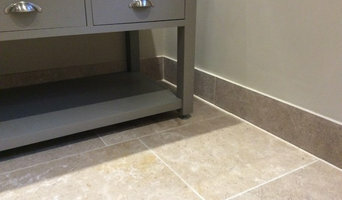 We have a heap of experience and many implemented projects for tiling and wood flooring works. We can offer full service from advice, design through to completion, all to suit your budget. Turning client needs and requirements into reality, we consistently work to the highest standards, producing quality finishes and often exceeding client expectations. By providing wood flooring and tiling services, our company only uses the best materials on the market, while strict adherence to technology, thereby achieving long lasting results and aesthetic quality of the finish. This is evidenced by numerous positive feedback’s from our customers. With our experience, knowledge and professional management of our projects we offer competitive, quick and reliable services. To get a free quote please contact us via email or call and we will be happy to assist you. We specialise in the design, specification and supply of sanitary ware and bathroom fittings to both the trade and homeowner. We offer a wide range of bathroom suites and accessories from leading brands to cover all budgets and tastes, from Shower Enclosures to Bathroom Furniture, Brassware and more. With vast experience in the industry, we understand the importance of customer service, and always strive to ensure the highest standard of work on all Balinea projects. This key principle is carried through from the start of the design process right through to completion and after sales. At Balinea, we pride ourselves on being different from the rest. Our approach to the design of each bathroom ensures each project is unique, and suits the client’s individual style and taste. bathstore is the UK’s leading specialist bathroom retailer. We are the bathroom experts, we design, assist, deliver, install and above all, we care. We support our customers throughout their journey, from inspiration to installation and we offer free design services and product advice, from trained instore experts. From our showroom in Glastonbury our small team of designers can make any kitchen and bathroom idea a reality as all of our manufacturing is done on site. Being a family run company with 40+ years industry experience we pride ourselves on quality, long-lasting kitchens and beautiful bathrooms as well as great client relationships. The kitchen is often the heart of your home and we aim from day one of the planning process, to be at the heart of yours. We also create stunning and practical bathrooms to suit all types of homes. By working closely with you and keeping you well informed along each stage of the renovation you are truly the central inspiration in the completion of your tailor made space. Our small, dedicated team are available to guide you through the steps of how to get your project organised from start to finish. Get in touch and let us create your dream space. Established in 1979, Centralheat Acton Limited (trading as bathroomOne), are nestled in the heart of the coveted Poet's Corner neighbourhood of Acton, West London. Our family run business began by predominantly offering plumbing and heating supplies to local tradesmen. We were the first plumbing and heating retailer to open up in the area, allowing us the opportunity to grow rapidly in a short period of time, and in the process, build an extensive and loyal client base. 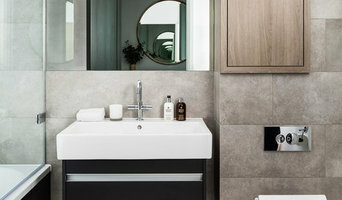 Over the years, we've introduced bathrooms to our offering and have since evolved into a company focused on offering a portfolio of only the finest designer Italian, German & British bathroom brands to our clients, as well as providing all the plumbing solutions required to build a complete bathroom. Welcome to Flush Fitting Ltd. A trusted and reliable Bathroom specialist company based in South West Birmingham. We have over 15 years of experience in the building, plumbing, and carpentry trade - the last 8 years focusing solely on bathrooms. Every bathroom is different, but every customer wants the same. It's about providing a solution, a bespoke one that pleases the eye, and serves you to perfection. We strive to be different and stand out from the rest. We like to exceed our customers expectations. We are an independent, family-run business that specialises in the design and installation of bespoke bathrooms that range from traditional to contemporary styles. Our approach is simple. We are passionate about designing and installing a truly unique bathroom that exceeds our clients' expectations. There are no ‘off-the-shelf’ solutions with Eau - just a clear understanding of our clients requirements, teamed with our experience and ability to deliver and install your bathroom. Call EAU to discuss your next bathroom project! Ripples is a leading bathroom retailer - creating award-winning beautiful bathrooms for 30 years. We have a strong team of talented designers who focus on exceptional design experience, the finest fittings and most innovative products, to provide unique bathroom solutions. 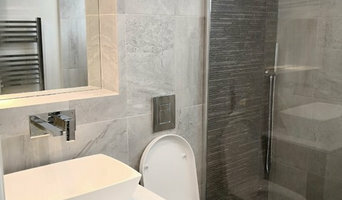 Bathrooms London Ltd is an established and reliable company with over 15 years’ experience in the building trade. We are happy to deal with the smallest domestic task to large commercial projects. Since October 2013 we have had the opportunity to work with the prestigious Bath Store and John Lewis companies due to the reputation we have earned for high quality standards of service and work. We cover Central London and all surrounding areas. At Bathrooms London Ltd, we understand that your house is more than just bricks and mortar, it is your home. This is why we pride ourselves on delivering a reliable and personalised service to all our customers. You can be assured of a safe, professional and high quality service by viewing our credentials for the FMB, CIOB and Trustmark on our website. We offer an extensive range of services, all of which are carried out to the very highest standards of quality and safety. We offer free, no obligation quotations to assess your individual requirements and will always treat your home with the utmost care and respect. An established Bathrooms, Tiles, Lighting, Heating and Plumbing Showroom in Harrow London. Supplying quality products for competitive prices. Our in-house designers aim to provide an excellent service when planning your dream space.